Operating in Angola’s Block 17 offshore oilfield, the giant Total CLOV FPSO (Floating Production, Storage and Offloading) vessel relies on its HVAC system not only for the comfort and safety of crew members but also to provide a stable operating environment for PLCs and associated critical control equipment. The application demands precise accuracy to maintain air quality and ventilation in the many enclosed cabins, offices, sub-stations and PLC rooms contained inside the massive vessel. The temperature has to be accurately controlled and the air supply has to be constant, so when actuators were needed on the HVAC air handling units and cooling water supply, Rotork CMA and CVA electric process control valve actuators were selected for their proven field performance. Working with the CLOV HVAC maintenance team, engineers from Rotork South Africa installed and commissioned the new actuators, which were supplied in accordance with the Total CLOV marine specification. Operating from the existing 4-20mA control signal, the actuators provide precise and responsive valve positional control and feedback, with repeatability and resolution at less than 0.1%. Following the installation, CLOV has reported that the HVAC is operating at 100% efficiency and there have been no failures. Rotork has a long association with Total’s offshore and onshore projects in Angola through its South African company and its agent in Angola. 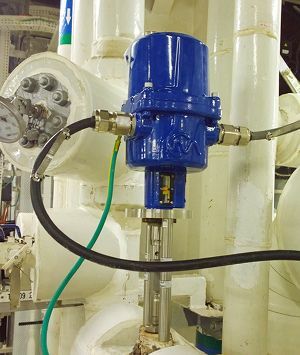 More than 400 heavy duty Rotork CP and GP pneumatic actuators were supplied for installation in many areas of the CLOV vessel’s processing plant, including those parts designed to limit environmental impact by eliminating flaring under normal operating conditions, recovering heat from turbine exhaust and recovering vent gases. Rotork’s professional performance throughout the duration of that contract and contribution to the timely CLOV start-up was recognised with the letter of appreciation from the vessel’s constructors. Find out more about Rotork Process Control Actuators.